Publix is a grocery store that is very popular in Florida. They have been under heat because Publix covering magazines with Trump on the cover. There has a screen covering magazines which have Donald Trump on the cover. Particularly, the National Enquirer magazine is the one that has been covered. These screens are usually reserved for magazines that have adult content on the cover. As it turns out, the reason the magazine is covered has more to do with the National Enquirer than it does Donald Trump. The company has been receiving complaints from customers about the content on the cover of the magazine. The decision to cover this magazine was made at a corporate level. 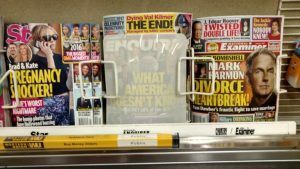 “The National Enquirer receives the most customer complaints about front page content, so they were added to the list of magazines required to be covered, just last week,” a Publix corporate spokesperson said in a statement, according to WFTX-TV. David Pecker is the tabloid’s CEO and chairman. He considers Donald Trump a friend of his. He has known Donald Trump for 25 years and has been a big supporter of him during his presidential run. To go along with that, the National Enquirer endorsed Trump earlier this year.